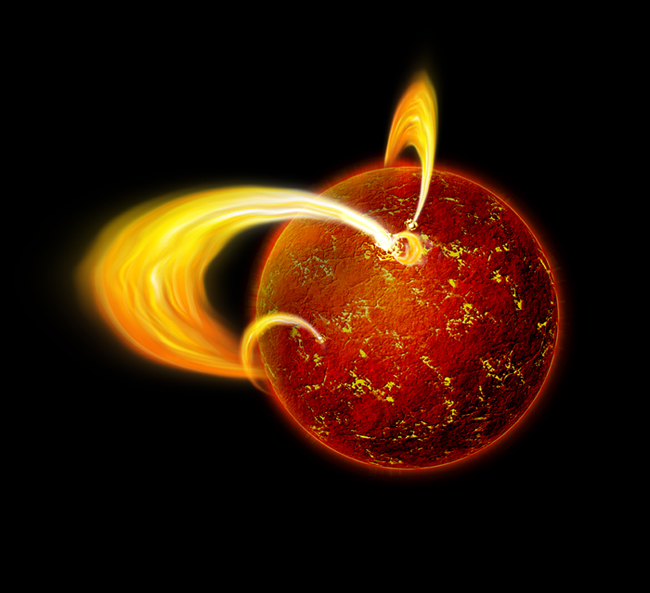 A magnetar near the Milky Way’s supermassive black hole is exhibiting some unusual behavior. Magnetars are dense, collapsed stars (called “neutron stars“) that possess enormously powerful magnetic fields. At a distance that could be as small as 0.3 light years (or about 2 trillion miles) from the 4-million-solar mass black hole in the center of our Milky Way galaxy, the magnetar is by far the closest neutron star to a supermassive black hole ever discovered and is likely in its gravitational grip. Since its discovery two years ago when it gave off a burst of X-rays, astronomers have been actively monitoring the magnetar, dubbed SGR 1745-2900, with Chandra and the European Space Agency’s XMM-Newton. The main image of the graphic shows the region around the Milky Way’s black hole in X-rays from Chandra (red, green, and blue are the low, medium, and high-energy X-rays respectively). 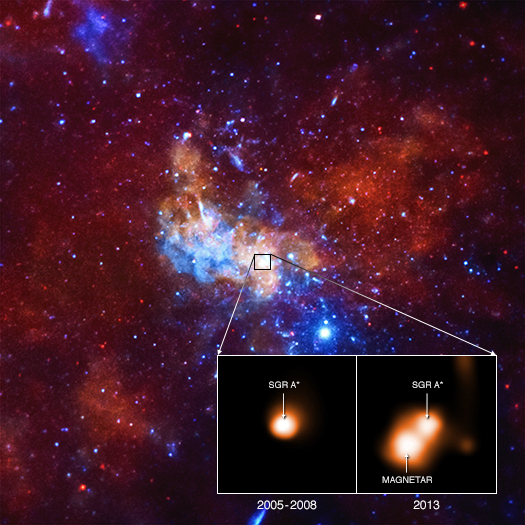 The inset contains Chandra’s close-up look at the area right around the black hole, showing a combined image obtained between 2005 and 2008 (left) when the magnetar was not detected, during a quiescent period, and an observation in 2013 (right) when it was caught as a bright point source during the X-ray outburst that led to its discovery. The team first considered whether “starquakes” are able to explain this unusual behavior. When neutron stars, including magnetars, form, they can develop a tough crust on the outside of the condensed star. Occasionally, this outer crust will crack, similar to how the Earth’s surface can fracture during an earthquake. Although starquakes can explain the change in brightness and cooling seen in many magnetars, the authors found that this mechanism by itself was unable to explain the slow drop in X-ray brightness and the hot crustal temperature. Fading in X-ray brightness and surface cooling occur too quickly in the starquake model. The researchers suggest that bombardment of the surface of the magnetar by charged particles trapped in twisted bundles of magnetic fields above the surface may provide the additional heating of the magnetar’s surface, and account for the slow decline in X-rays. These twisted bundles of magnetic fields can be generated when the neutron star forms. The researchers do not think that the magnetar’s unusual behavior is caused by its proximity to a supermassive black hole, as the distance is still too great for strong interactions via magnetic fields or gravity. Astronomers will continue to study SGR 1745-2900 to glean more clues about what is happening with this magnetar as it orbits our galaxy’s supermassive black hole. These results appear in Monthly Notices of the Royal Astronomical Society in a paper led by the PhD student Francesco Coti Zelati (Universita’ dell’ Insubria, University of Amsterdam, INAF-OAB), within a large international collaboration including N. Rea (University of the Amsterdam, CSIC-IEEC), A. Papitto, D. Viganò (CSIC-IEEC), J. A. Pons (Universitat d’Alacant), R. Turolla (Universita’ di Padova, MSSL), P. Esposito (INAF, CfA), D. Haggard (Amherst college), F. K. Baganoff (MIT), G. Ponti (MPE), G. L. Israel, S. Campana (INAF), D. F. Torres (CSIC-IEEC, ICREA), A. Tiengo (IUSS, INAF), S. Mereghetti (INAF), R. Perna (Stony Brook University), S. Zane (MSSL), R. P. Mignani (INAF, University of Zielona Gora), A. Possenti, L. Stella (INAF). Thanks for explaining about the colors in the images! I always wonder, looking at these telescopic images, how close to “true color” they are. You can often find images of the same nebula in a variety of color schemes depending on how they’re coding color, I presume, which makes me wonder if any of them are anything akin to “real color” or if many of these objects (like nebulae) are just too faint to be seen in any meaningful capacity by the naked eye, even from close-up. I would love to take credit for the explanations. But I cannot. Everything I give you was in the article from the source. The link to the original article is near the bottom of every post.